A hidden danger can be hiding in all the lovely older homes and businesses in Westchester County, NY: Asbestos. Asbestos removal and abatement of that asbestos is critical, but first it must be determined if your family or workers have been exposed to the dangers of asbestos. If your Westchester County, New York based home or business was built before 1978, it is a good bet that the building is rife with this invisible killer. Asbestos was used in asbestos roofing, asbestos insulation, plaster, sheetrock, asbestos floor tiles, even for wrapping pipes and many other building materials. One of the most common and dangerous places where asbestos is found is in the popcorn ceiling tiles popular for decades. When that material breaks apart, asbestos fibers fill the air—and the lungs of anyone exposed, causing Mesothelioma, cancer, pneumonia or another life-threatening lung disease called Asbestosis. We have the air tested for asbestos by an independent third party and, when it is found, seal off the area with commercial grade plastic. By use of negative air machines and wetting down the material to avoid it going airborne when disturbed, we create a non-contamination zone, protecting you from further exposure. Once the asbestos has been removed, we seal any exposed portion with special shellac, abate the area with HEPA-filtered vacs and remove the hazardous waste to a special landfill. Your home or commercial space is returned to normal with all asbestos danger removed. The air is sampled afterwards to check that no asbestos remains in your environment. 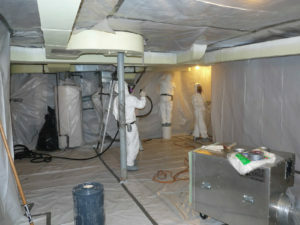 For asbestos removal and abatement services in Westchester, New York, call (877) 645-1428.